Rural Energy is one of the leading biomass engineering companies in the UK and one of the company’s offerings is the service and maintenance of biomass installations. With over 1,000 biomass boilers installed through Rural Energy and its partner companies throughout Great Britain, the company’s service and after sales team is dedicated to ensuring that once a project is complete, there is continued aftercare to safeguard the efficient running of the system. There are numerous reasons why properly maintaining your biomass installation and having it serviced by a fully qualified engineer are important, not least because it is a valuable investment that requires some TLC to operate efficiently and prolong the equipment’s life span. There are also regulatory and financial reasons to stringently keep up with the installer or manufacturer’s guidelines, including receiving benefits and incentives. 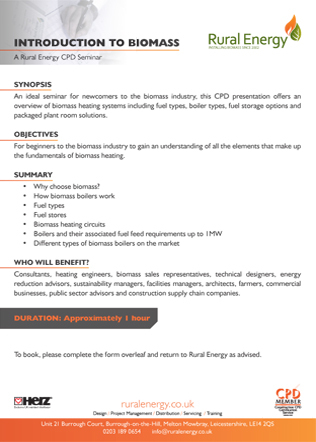 The government’s Renewable Heat Incentive (RHI) for example requires biomass system owners applying for or already receiving these incentive payments to ensure the maintenance procedures are adhered to and a qualified engineer services the installation. Rural Energy is committed to supporting its clients throughout the life of their biomass boiler installation and offers bespoke service and maintenance agreements to fit in line with the needs of each individual owner and their system’s requirements. Standard service contracts are available for typical annual use or high usage systems which can be tailored to suit individual needs through a selection of bolt-on options. From monthly maintenance duties when time or staff are limited to deal with these in-house, to flue cleaning and performance optimisation, Rural Energy’s service team and their offerings provide clients peace of mind.